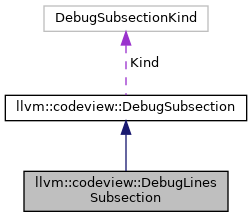 Definition at line 105 of file DebugLinesSubsection.h. Definition at line 71 of file DebugLinesSubsection.cpp. Definition at line 89 of file DebugLinesSubsection.cpp. References addLineInfo(), assert(), B, llvm::codeview::ColumnNumberEntry::EndColumn, and llvm::codeview::ColumnNumberEntry::StartColumn. Definition at line 81 of file DebugLinesSubsection.cpp. References B, llvm::codeview::LineNumberEntry::Flags, llvm::codeview::LineInfo::getRawData(), and llvm::codeview::LineNumberEntry::Offset. Definition at line 137 of file DebugLinesSubsection.cpp. References B, hasColumnInfo(), and Size. Definition at line 119 of file DebugLinesSubsection.h. References llvm::codeview::LineFragmentHeader::CodeSize, llvm::codeview::LineFragmentHeader::Flags, llvm::codeview::DebugSubsection::kind(), llvm::codeview::LF_None, llvm::codeview::Lines, llvm::codeview::LineFragmentHeader::RelocOffset, llvm::codeview::LineFragmentHeader::RelocSegment, and Size. Definition at line 103 of file DebugLinesSubsection.cpp. References assert(), B, llvm::codeview::LineBlockFragmentHeader::BlockSize, llvm::codeview::LineFragmentHeader::CodeSize, llvm::codeview::EC, llvm::codeview::LineFragmentHeader::Flags, hasColumnInfo(), llvm::codeview::LF_HaveColumns, llvm::makeArrayRef(), llvm::codeview::LineBlockFragmentHeader::NameIndex, llvm::codeview::LineBlockFragmentHeader::NumLines, llvm::codeview::LineFragmentHeader::RelocOffset, llvm::codeview::LineFragmentHeader::RelocSegment, llvm::Error::success(), llvm::BinaryStreamWriter::writeArray(), and llvm::BinaryStreamWriter::writeObject(). Definition at line 75 of file DebugLinesSubsection.cpp. Definition at line 158 of file DebugLinesSubsection.cpp. Referenced by calculateSerializedSize(), and commit(). Definition at line 154 of file DebugLinesSubsection.cpp. Definition at line 156 of file DebugLinesSubsection.cpp. Definition at line 148 of file DebugLinesSubsection.cpp.